Find out how doctors, scientists, and even politicians worked together to bring an end to this deadly disease in the United States. Polio has been around for thousands of years. An Egyptian mural depicts a priest with a withered leg, one of the common results of this dreaded disease. In the 20th century, polio epidemics in the U.S. killed thousands of children and left many more paralyzed. Some who were not paralyzed were crippled for the rest of their lives or had deformed limbs. 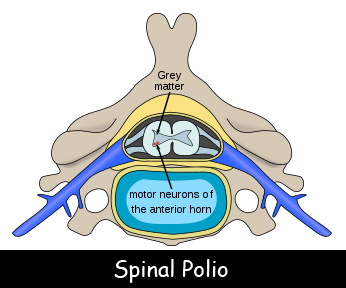 Polio could also cause blindness and general muscle weakness. Children who were paralyzed often had trouble breathing because their lungs no longer worked correctly. These children were placed in machines called “iron lungs.” The machines pushed the lungs up and down, essentially breathing for the child. Some good things came out of the polio epidemics. Recovery from polio required long periods of physical therapy. Treatments for polio helped doctors discover treatments for other conditions. The first intensive care units were developed to treat polio. In 1952, Jonas Salk produced the first widely used polio vaccine. Albert Sabin introduced a second vaccine a few years later. Today, polio outbreaks occur in just a few places in the world. Doctors hope that disease will eventually disappear for good. Question: Did Franklin D. Roosevelt have polio? Answer: Yes. Roosevelt was a rising politician when he got polio at the age of 39. The disease left him weakened and paralyzed. Roosevelt refused to be defeated. He left politics and spent several years exercising and working to regain his health. When he finally came back to politics, Roosevelt worried that the American public wouldn’t accept him. At that time, people with disabilities were ignored, mistreated, and often placed in asylums out of view of the public’s eye. They were not allowed to work. Roosevelt’s personality and leadership helped him change people’s perceptions of disabilities. He served four terms as president and helped make new laws protecting people with disabilities. See photos of President Roosevelt. Declan, Tobin. " Polio Facts – Healthcare for Kids ." Easy Science for Kids, Apr 2019. Web. 26 Apr 2019. < https://easyscienceforkids.com/polio/ >.